An aircraft production facility was being constructed at Bombardier Aerospace, Belfast, where the new C-Series aeroplane will be built. The initial £1.6million contract was for the installation and testing of 2519no precast concrete piles, for a safe working load of 1000kN. 937no were 355mm2 and the remainder were 270mm2. Five Junttan self-erecting and fully computerised piling rigs were utilised to complete the works within the programme period. Eight preliminary pile tests were performed in order to facilitate pile design and twenty-four working static pile tests were performed throughout the course of the contract in order to verify pile performance on an on-going basis. We also dynamically tested 10% of all installed piles. 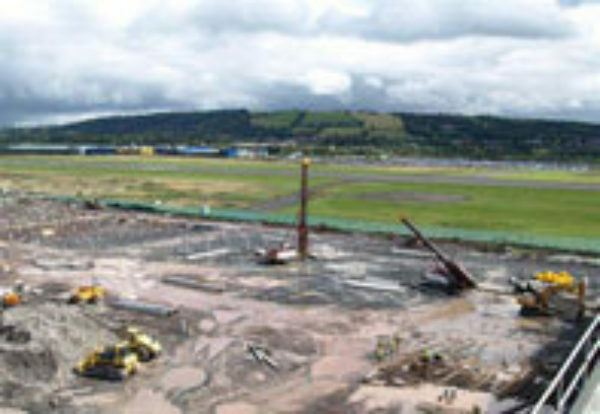 The project consultant engineer was Scott Wilson Ltd, Belfast, who liaised closely with FKL in terms of agreeing pile capacity and settlement characteristics. Vibration monitoring, tubular steel piling and pre-boring were also required in some areas of the site in order to facilitate installation of the piles under controlled conditions next to the existing live factory. FK Lowry Piling were subsequently awarded an extension to their initial contract to include a further £800,000 of 355mm precast concrete driven piles for the same facility over an additional 4 week period.